This is an unusual business for the times. It is small and family owned. 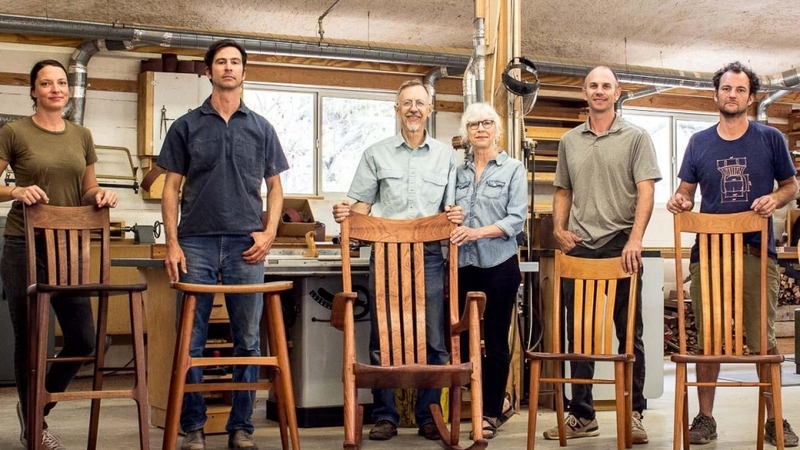 This business took root in 1992 with the design of the Weeks Rocker. I, Gary Weeks, work with my wife, son, and five other artist-craftsmen in a shop we built. Together, we make furniture and send it to interesting people who are pleased and appreciative. Guests come and say we are living a dream. When I look up, I see it. This business serves an international clientele without distributors. The internet has made our market the world. People searching for rocking chairs, comfortable dining chairs, handmade trestle tables, barstools, and numerous other items and descriptions find our site. Our design, materials, workmanship, guarantee, service, and ratio of price-to-value stand out. "Websearch," “repeat,” and “word of mouth” sustain us. This furniture is made in the USA. For many, including us, this is important. Our designs are original. This furniture is straightforward. If it is a chair, it is comfortable. If it is a table, it is sturdy. And that is how they look. Function secured, we shape line, form, and contour to animate light and shadow into movement and grace. We enhance art and handwork with the efficiencies of manufacturing. Wood is a medium as well as a material. Using the color, figure, and character of the wood, we create a unique composition within the form of each individual piece of furniture. We carefully select, before we reverently cut. We use machinery and organization to produce precision; we use handwork to create distinction. We build furniture to the highest standards of craftsmanship. Because much of the structure of our furniture is exposed, there is no place to hide less than impeccable technique — our craftsmanship is evident. The joints fit and are fitting. In the revealing reflection from the satin surface, the planes, edges, and shapes show true to line, to curve, and to contour. The finish delights the hand as well as the eye. We honor the sources of our success. We serve our customers. We are loyal to our suppliers. We provide flextime, unusual benefits, good working conditions, profit-sharing, and open books to our employees. We recycle, reduce waste and pollution, and compost wood shavings and dust. All of our cherry, maple, and mahogany lumber is certified by the Forest Stewardship Council. We support community and charitable efforts. We ask people to purchase a product that will outlive them. Our patrons are investors, not consumers. Our furniture is an asset to convey to heirs. All photos on the site, and more, are readily available. We can provide photos taken to your specifications.